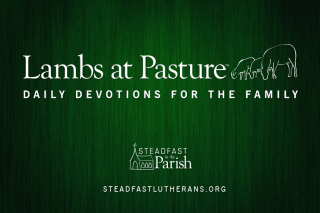 Lambs at Pasture is a free educational offering designed to highlight the readings of the historic one-year lectionary. Each edition focuses on Sunday’s lessons and is divided into small, bite-size portions. Discussion questions are designed to help engage everyone (young and old) with the Bible passages being paired with Luther’s Small Catechism. This combination of Scripture and Catechism makes it a great resource for families. Each Lambs at Pasture is a single sheet of paper (double-sided), folded in half, and printed in black-and-white. 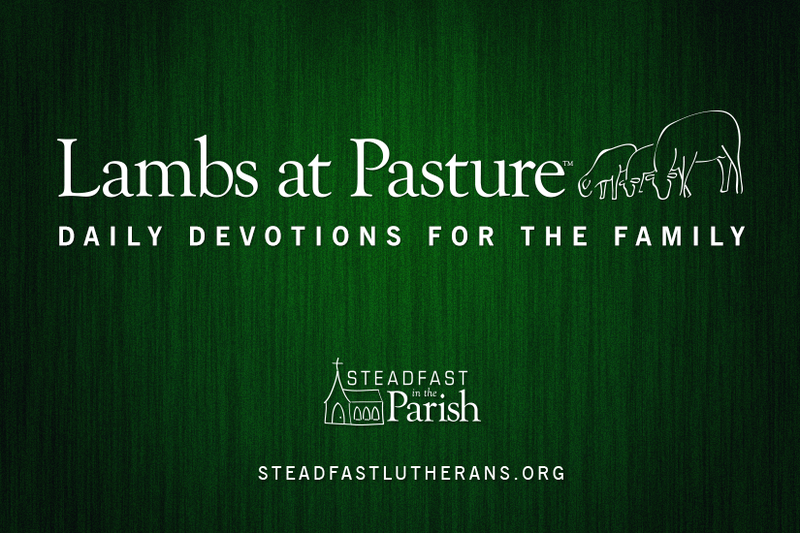 The premier issue of Lambs at Pasture will be for Invocavit (the First Sunday of Lent). If you prefer an email notification when the next issue is available, please sign up here. Designate one person to be the leader. Be sure to explain any new or difficult words to help the children understand their meanings. A copy of the Bible, Lutheran Service Book (LSB), and Luther’s Small Catechism with Explanations is needed. Read the Introit responsively (the leader begins and everyone else responds with the bolded text). Look up and read aloud the assigned Bible passages. (If the children are old enough to read, read the passage aloud together.) The leader will ask the discussion questions and the children will answer. (If the children are old enough to write, have them fill in the answers themselves.) An answer key is available to assist the leader if needed. Some of the Bible passages correspond with the explanation questions at the back of Luther’s Small Catechism with Explanations, look up the questions and read them together. There is not an assigned reading for Fridays; however, there is an activity. Read together the Memory Verse of the week. Challenge yourself and the kids to memorize the verse. Look up and read aloud together the Catechism Connection information using your Small Catechism or the Lutheran Service Book (pages 321-330). The repetitive nature of Lambs at Pasture aids familiarity and memorization of key passages. This is especially true when used in conjunction with the Daily Prayer meditation found in the Lutheran Service Book (page 295). We hope you share this weekly resource and make printed copies available for members and visitors to take home with them. If you prefer to avoid the expense of printing, please consider adding a link in your bulletin. Links can easily be shared on your congregation’s social media sites as well. It appears you don’t have a PDF plugin for this browser. Click here to access the PDF file. I love this! Regrettably, our church is 3 year lectionary so unsure how/if I could use this wonderful tool. This is fantastic! I wish our congregation was using the 1-year lectionary…but our WALTHER Group does, so I am going to try this! Thank you! The way this connects the lectionary readings with the Catechism is just fantastic. Faith and Truth and Life Bestowing could be replaced with a Lutheran hymn, maybe Lord Keep Us Steadfast in Your Word or Preach Ye the Word. This is an awesome resource! 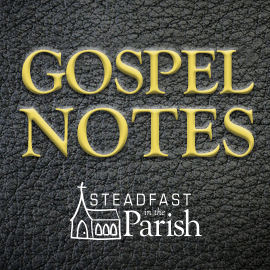 If we could get people singing Lutheran hymns (not Dudley-Smith) that would be even better! Sequentially build smart-leveraged method	adjustments.